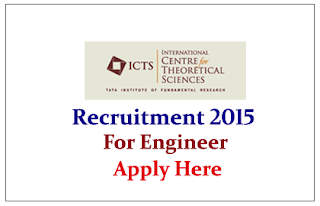 International Centre for Theoretical Sciences (ICTS) is recruiting for the post of Engineer in civil department for the year of 2015.Location atbangalore. Eligible candidate can apply online on or before 30.05.2015. The International Centre for Theoretical Sciences (ICTS), a centre of the Tata Institute of Fundamental Research, is a research institute based in Bengaluru, India. Founded in 2007, ICTS has grown from a fledgling institution to a global centre of activity in various areas of science. Prof. Spenta R. Wadia is the founding director. Interested candidates should submit their applications online at the ICTS website. Hard copy of the submitted application (copy of filled application form will be sent to you by email) along with the true copies of relevant certificates/testimonials should reach to below address last date to submit the application is 30.05.2015. The envelope should be clearly marked “ICTS Recruitment” and the advertisement number and post applied for should be quoted next to it.